Instant ramen has always been a poor man’s game, but you can still eat like a prince even if your tote is broke. All it takes is some cheap meats, pantry staples, and a few key upgrades that offer a lot of bang for your buck. A little note on how we did this: We calculated the cost of each recipe by how much it’d be to purchase the minimum number of individual ingredients (not cost per serving). 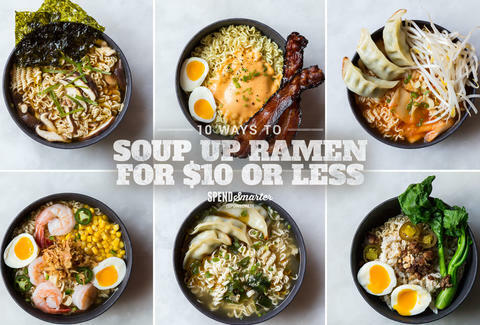 Meaning your first bowl may cost $10, but by bowl 13 you could be eating for $0. And they say economics is the dismal science. Pshaw. And these 10 suggestions are just a launching point. 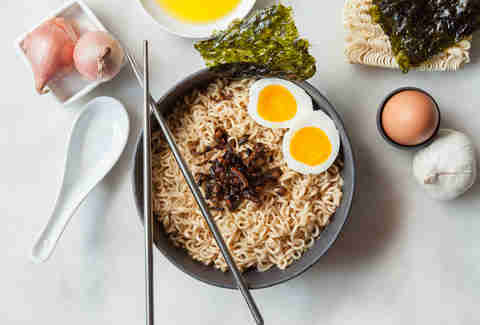 Go crazy and let us know what your favorite ramen toppings are in the comments section below. Please do not take "go crazy" literally because we have families who read the Internet, thank you. 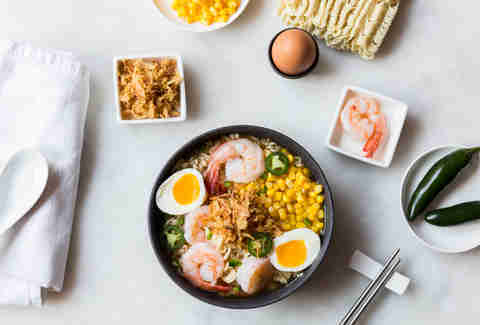 Place 1 package of shrimp-flavored ramen and its seasoning contents into a bowl along with 4-5 large raw shrimp (peeled). Pour 3 cups boiling water into the bowl, cover, and let sit for 3-4 minutes, or until shrimp is pink and opaque or you're done listening to one track off of Norah Jones' Come Away With Me. 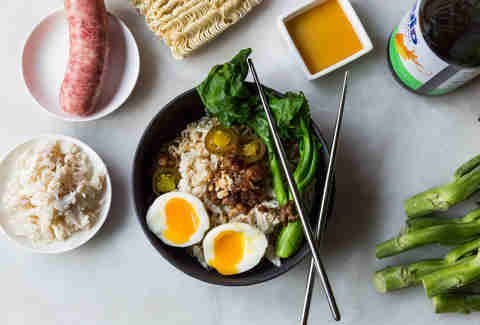 Uncover, stir, and top with ⅓ cup canned corn (drained), ½ jalapeño (sliced or minced), soft-boiled egg (cut in half), and fried onions. Cook 4 ounces uncased pork sausage in a skillet over medium-high heat, breaking it into small pieces with a wooden spoon. Once the sausage is browned, add 1-2 stalks of Chinese broccoli (you can chop them up or leave them whole); cook for 1-2 minutes, until bright green and slightly wilted. Remove from heat and set aside. Place shrimp-flavored ramen and its seasoning contents into a bowl. Pour 2 cups boiling water over it, cover, and let sit for 2-3 minutes. 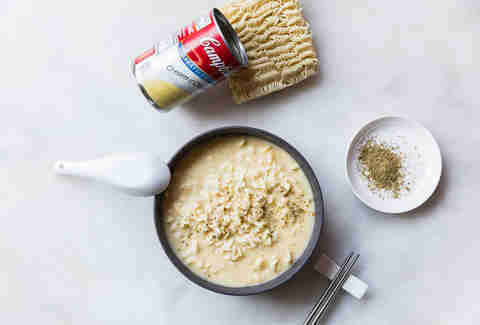 Drain noodles, lightly coat with olive oil, and return noodles to the bowl. Top with sausage, broccoli, 2 ounces lump crab meat, soft-boiled egg (cut in half), crushed peanuts, and pickled jalapeños if you live dangerously. Season with fish sauce, rice vinegar, and sugar to taste. In a medium saucepan, heat 1 tablespoon vegetable oil over medium-high heat. Add 2 tablespoons green curry paste; cook for 1-2 minutes, until fragrant. Add 1 can coconut milk, stir to combine and bring to a simmer. Add ⅓ cup bamboo shoots and 1 package ramen noodles (without seasoning packet); reduce heat to low and cook until noodles are soft and separated. Transfer to a bowl and top with a jalapeño (deseeded and sliced lengthwise). Garnish with fresh basil or cilantro. Ladies love garnish. Also men. All people enjoy garnish, really. 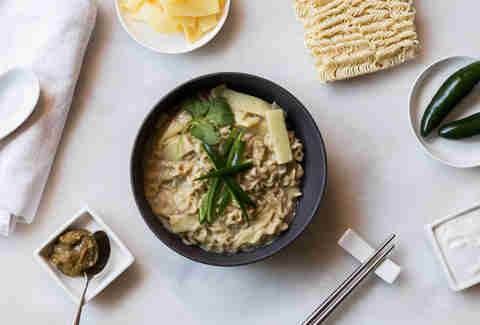 In a medium saucepan, combine 3 cups water, ½ stalk of lemongrass sliced crosswise into 1-inch pieces, and 1 knob of ginger sliced (wafer) thin; bring to a boil. Add 1 tablespoon Thai roasted chili in oil, ½ cup dried mushrooms, and 4-5 large raw shrimp (peeled). Cook until shrimp is pink and opaque. 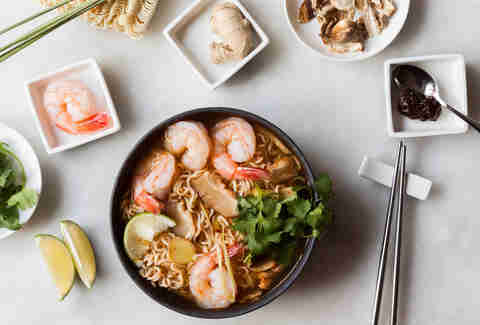 Add 1 package shrimp-flavored ramen with its seasoning contents; cook until noodles soften and separate. Transfer to a bowl, squeeze a lime wedge over it, and garnish with cilantro. Heat 1 tablespoon oil in a medium skillet over medium heat. Place 5 frozen gyoza dumplings in the skillet and cook for 3-4 minutes or until the underside is browned. Pour 2 tablespoons water into the pan, cover, and let steam for 1-2 minutes or until dumplings are tender on top. Remove from heat and use all your willpower to set aside and not jam in your mouth. 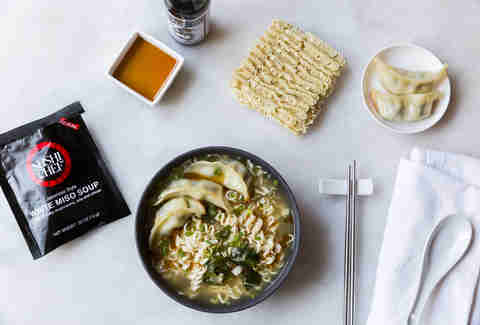 Place a package of ramen (without seasoning packet) and a ½-ounce envelope of miso soup powder into a bowl. Pour 2 cups boiling water over it, cover, and let sit for 2-3 minutes. Stir to break up noodles. Top with gyoza and 1 teaspoon toasted sesame oil. Cook 2-3 strips of thick-cut bacon in a large skillet over medium-high heat until crisp. 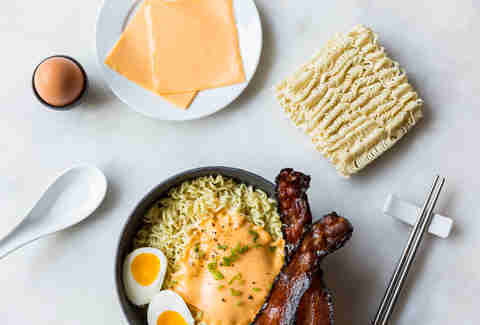 Place a package of chicken-flavored ramen with its seasoning contents into a bowl. Pour 2 cups boiling water over it, cover, and let sit for 2-3 minutes. Stir to break up noodles. Top with 2 slices American cheese, soft-boiled egg (cut in half), bacon, minced scallions, salt, and pepper. Now realize you've possibly made corner deli breakfast sandwiches obsolete. Place 1 cup sliced shiitake (pronounce it right, you hooligan!) mushrooms and a package of beef-flavored ramen with its seasoning contents into a bowl. Pour 2 cups boiling water over it, cover, and let sit for 2-3 minutes. Stir to break up noodles. Top with 1 teaspoon black truffle oil, sliced scallions, and roasted seaweed. Heat up 1 can “cream of chicken” soup and 1 cup water in a saucepan over medium-high heat. Once simmering, add 1 package of ramen (without seasoning packet) and cook until noodles are soft and separated. Transfer to a bowl and top with a sprinkling of dried Italian seasoning. Curse your mom for not thinking of this on grade school sick days. Heat 1 tablespoon oil in a medium skillet over medium heat. Place 5 frozen gyoza dumplings in the skillet and cook for 3-4 minutes or until the underside is browned. Pour 2 tablespoons water into the pan, cover, and let steam for 1-2 minutes or until dumplings are tender on top. Remove from heat and set aside. 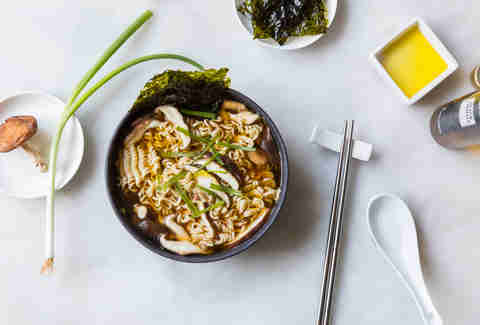 Place ½ cup kimchi and a package of chicken or pork-flavored ramen with its seasoning contents into a bowl. Pour 2 cups boiling water over it, cover, and let sit for 2-3 minutes. Realize that you should know how to do this step by now if you've read this far. Stir to break up noodles. 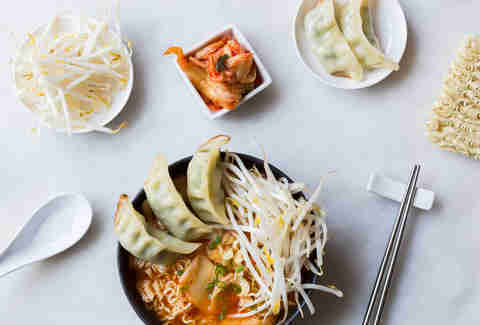 Top with gyoza and ½ cup bean sprouts. Heat 2 tablespoons vegetable oil in a medium skillet until shimmering. Add 3-5 minced garlic cloves and 1-2 thinly sliced shallots. Stir constantly until crisp and golden, about 1-2 minutes. Stir in 1 teaspoon soy sauce and ¼ teaspoon sugar. Remove from heat. Place a package of beef-flavored ramen with its seasoning contents into a bowl. Pour 2 cups boiling water over it, cover, and let sit for 2-3 minutes. Stir to break up noodles. Drizzle with ¼ teaspoon toasted sesame oil. Top with roasted seaweed, soft-boiled egg (cut in half), fried garlic, and shallots. Fashion a ramen crown from a second package and anoint yourself king of instant noodles.